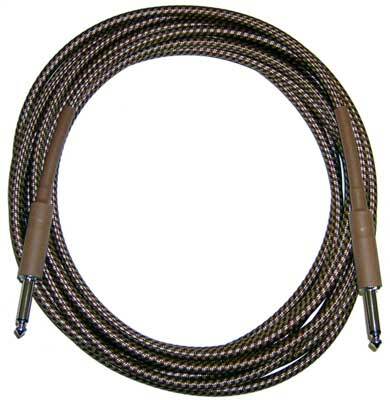 CBI's American Made Guitar Instrument cable is ideal as a guitar cable, patch cord, keyboard cable, or anywhere a 1/4 inch to 1/4 inch connection is required. The 20 gauge CBI Instrument Cable also works great between processors, pedals, effects to amplifier even from your mixer to your power amp. CBI uses high quality wire and superb connectors in these affordable, durable guitar instrument cables. 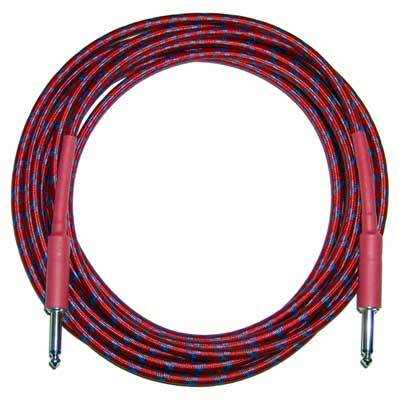 This is the best-valued overbraid instrument cable available, designed by CBI for American Musical Supply and made in the USA. The braided nylon cloth provides flexibility with 'no fray' weaving, proven to be very durable. CBI not only provides heat shrink over the nickel 1/4' barrel but under as well, ensuring maximum strength for years of satisfaction. C.B.I. features unsurpassed delivery, flexibility, and quality for the Recording Studio, Live Audio, and Sound Installation Wiring markets. C.B.I. products include many top of the line components, such as Belden cable, Switchcraft, G&H, and Neutrik connectors. C.B.I. 's product lines encompass a wide range of professional wiring systems for musical instruments, sound reinforcement, sound installation, audio/video, recording & broadcast, as well as bulk wires, connectors, adapters, and custom designs. In addition to being a well-established and respected force in the retail music industry with over 20 years of experience, C.B.I. has been a pioneer in the field of designer cables and is unparalleled in the custom cable market.